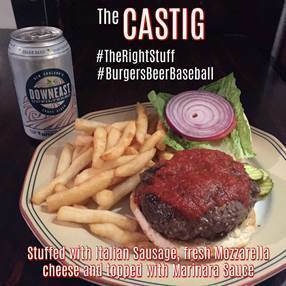 With the Red Sox in New York to play the Yankees this week, Foley’s NY Pub & Restaurant (18 W. 33rd St.), has announced “The Castig Burger” as its stuffed burger of the week. The burger is named after Red Sox radio broadcaster Joe Castiglione and his son, Duke, a longtime sportscaster on Fox 5 in New York. The Castig Burger is stuffed with Italian sausage and fresh Mozzarella cheese and topped with marinara sauce. The burger can be paired with a Downeast New England Craft Cider or any of Foley’s selection of 101 brews.